Smart dust is a name given to extremely small computing particles, RFID chips, or other very small technologies. It is promoted as an eventuality, that smart dust will cover streets and buildings to identify people, that people will have smart dust in their bodies, and other things in mainstream television and media. They paint a utopian, blissful picture of it. However, the history of entities involved in creating smart dust show a different perspective. The same entities who create destructive technology (drones, surveillance technology, technology for warfare) are involved with its creation: military industrial complex players, from the RAND Corporation to Hitachi, to DARPA and their collaborators in academia. As with all technology, the people who wield it determine whether it’s used for the benefit of, or against the common people. The Rand Corporation has been involved in morally reprehensible warfare, think tank activity and strategy in particular, for several decades. They were involved in nuclear war strategy, disrespecting the lives of everyone on the planet in scenarios where nuclear bombs would be detonated to retaliate against Russia at the expense of all life on Earth. With the recent announcement that the US government is looking into geoengineering research, it looks like an overt, involuntary treatment of the American people with geoengineering material is coming soon. They act as if they aren’t already spraying us. 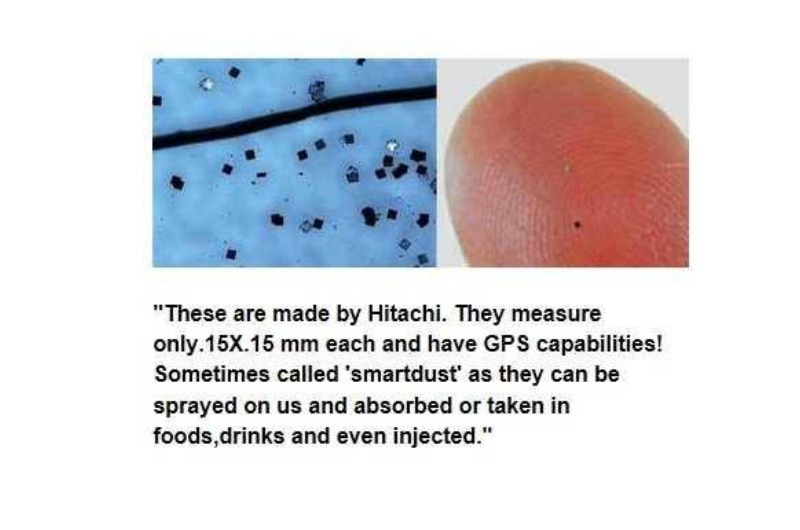 A central, historical player in Japan’s military industrial complex, Hitachi developed some of the smallest smart dust particles ever disclosed to the public, a full 15 years ago with the announcement of the 0.4mm x 0.4mm external antenna µ-Chip. As far back as 2001, “smart dust” was this small. It is depicted in this popular meme still circulating on social media. Considering how far back the technology goes, how small is the smallest “smart dust” today? Could it be small enough to perform functions inside the human body, or be involuntarily sprayed on us without us realizing it? Considering what we don’t know about the inner workings of DARPA, the institutes of technology so influential to modern warfare, and other historically dangerous institutions, what technology similar to smart dust could they be pioneering or even experimenting on us with? Understanding the history of recent human experimentation is necessary to understand the probability of involuntary treatment with smart dust. “The lenses—which included single, double, and triple optical elements—were printed on strands of optical fiber and standard digital sensors like those used in cameras. The researchers believe future applications include less invasive endoscopic medical imaging of the body—even injection into the brain—and nearly invisible camera sensors on miniature drones or robots. Injecting smart dust into a person’s brain for endoscopic medical imaging is “less” invasive? Using bacteria encapsulated in electrospun nanofibers to treat water and enrich soil for crops is being discussed as well, in powerful academic institutions such as Israel Institute of Technology. Geoengineering researchers suspect that the tiny, metallic looking particles found after chemtrail spraying may be a form of smart dust. People theorize that smart dust may be sprayed on us, and that a similar technology may even be forcefully administered to take control of the human body. Some question whether GWEN towers could be used in conjunction with smart dust-type-technology. While it’s not completely proven that people are being involuntarily treated with smart dust, if we want to anticipate the future and avoid a dystopian nightmare, we’d be wise to examine all the possibilities, because in the world today, technology that was heralded as revolutionary and life saving is often the complete opposite. Once the general public is coaxed into accepting something as life-saving, from that point forward, people who criticize the science are ostracized. This is not science as in, the scientific method of critically testing the effects of something and searching for evidence, but it’s dogma about technology. Vaccines are a perfect example. Once people became normalized to them, and people who questioned them were denigrated as conspiracy theorists, a threshold was crossed which makes it difficult to reach anyone with alternative info about them. Powerful institutions and their mad scientists are trying to cross this “threshold of normalization” with geoengineering as we speak, and they will try with smart dust. One day, the government could declare “we will now spray,” and those who say your health could be damaged by their geoengineering spray might be called crazy in a future where people are normalized to it. Those who insist other chemicals and things are being sprayed on us under the guise of overt geoengineering could be called paranoid, once the “threshold of normalization” is reached with the public. To remain in control over what technology is administered to us, because governments are pushing harder every day to make vaccines mandatory, breathing in particles sprayed in the sky, and other health damaging things, we have to not allow public opinion to reach that threshold of willfully accepting involuntary treatment. A technology that can be as dangerous as smart dust, geoengineering, etc, will certainly be used against public interests by the deep state and military industrial complex. Especially so while the American public is so sedated by the mainstream narratives regarding independent investigations into the workings of the ruling elite. Pedro Aquila is a staff writer for Waking Times. This article (Smart Dust – The Future of Involuntary Treatment of the Public) was originally created and published by Waking Times and is printed here under a Creative Commons license with attribution to Pedro Aquila and WakingTimes.com. It may be re-posted freely with proper attribution.